After just receiving and assembling all the fuselage parts of the Boeing 777-9 two weeks ago, Boeing has now switched on the internal power of the future aircraft for the first time. This is the first of many final steps before the finishing aircraft begins flight testing early next year. For Boeing, these next few stages are the real test if their concept actually works. Until now the aircraft has been ‘inert’ matter, just a couple of metal tube sections bolted together. But now it resembles something far closer to a real aircraft. “The 777X is a new airplane and a new production system, With the 777X, the production system was integrated into the development program sooner than any other airplane, and the team is doing a great job of hitting our milestones as expected.” – Josh Binder, vice president and general manager of the 777X. From here, Boeing will need to install and calibrate the various essential systems, such as flight controls, engines, and computer systems. The very last stage of the plane (after the flight tests) will be the actual fit out of passenger seats. It is unknown at this time if the first aircraft will just be a test craft, or if it will be the first of many 777-9’s for launch customer Emirates. 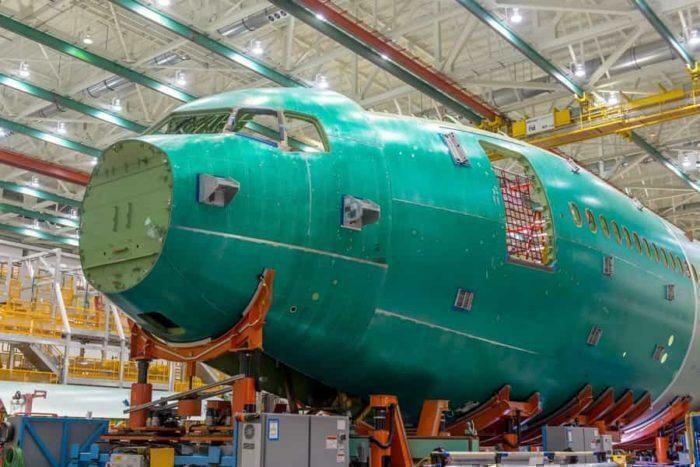 The Boeing 777-9 hull during assembly two weeks ago. Emirates of course, just took delivery of their last Boeing 777-300ER yesterday, meaning this first 777-9 will be the next aircraft they hope to receive from Boeing (They should continue to receive A380’s from Airbus in the meanwhile, but they won’t have the new Emirates first class!). 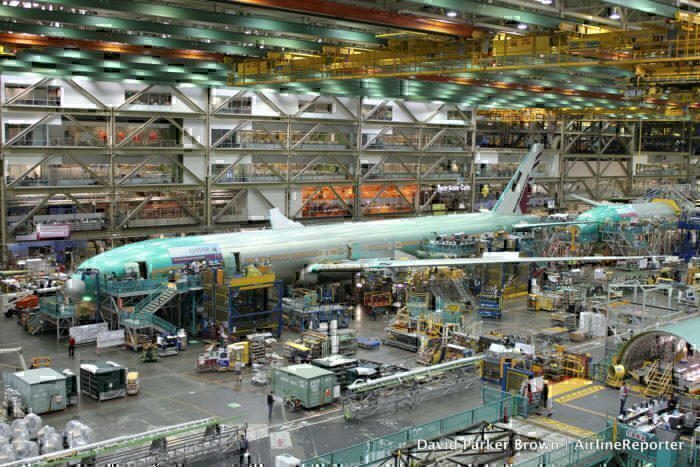 The 777-9 under construction on the Boeing factory floor. There are currently 273 orders for this aircraft, and 53 for the smaller, longer range 777-8. What is the 777-9 like? We have compared the 777 vs the Airbus A350 in a previous article that goes into a great scope and depth about the plane (And how it fares to the Airbus offering). The 777-9 will be one of the highest capacity wide-body aircraft available from Boeing (until they create a 777-10 stretch), seating 414 passengers in two classes and 349 passengers in three classes. 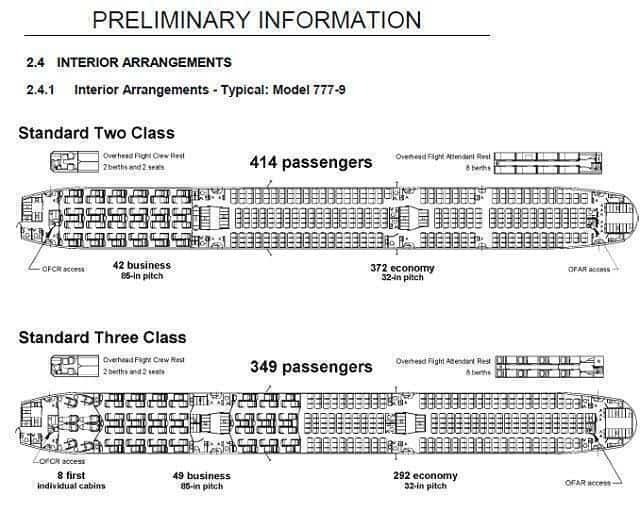 According to the specifications, it’s possible that a one class all economy version (don’t give United any ideas!) with 475 passengers might exist one day. 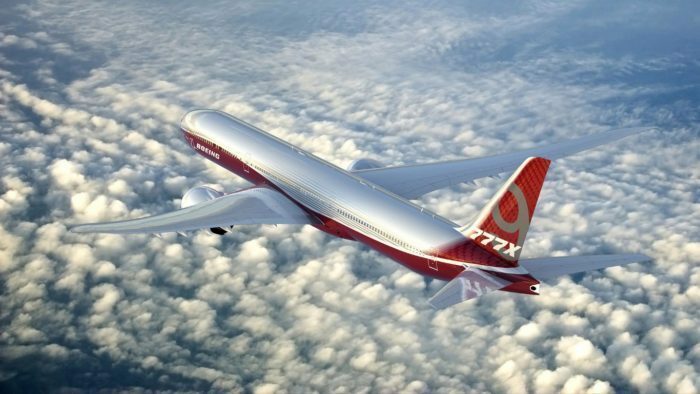 There are currently two designs for the Boeing 777-9, a two-class layout and a three-class layout. It is also very famous for having wings that are just too big to fit on a normal taxiway and gate. Thus, for the first time ever, the wing tips rotate upwards during taxi and then deploy when taking off. This functionality will be tested extensively as the world and more importantly, the American Federal Aviation Administration (FAA) watches on. This is the first real test of this technology and Boeing does not want any mistakes. To achieve a lower gross weight for the aircraft, Boeing will incorporate carbon-fiber-reinforced polymer that was used with success on the 787 aircraft. The 777-9’s windows will also be 15% larger than competing airliners and placed at a height that will be eye level for most passengers. What do you think of the new 777-9? Let us know in the comments. Do you really think that they weld the fuselage together? They don’t, you should do better research. Also folding wings have appeared on aircraft since at least WW2. This may be the first application in commercial aircraft and the functionality or sequence of operation is a little different. Correction: Airplane sections are never “welded together”. Section joins, as in most aircraft joints are typically riveted or bolted. Welding is seldom if ever done on aircraft. Its. But otherwise, great article! Your photo of the Qatar plane you captioned as the -9 under construction is not a 777X, it’s a standard 777. I am a EASA License Engineer with Boeing and Airbus on my license (B737/B777/A320/A330). B777 is far my preferred aircraft, trouble shooting is easy and MAT is my best friend, I love it and I’m just waiting to get diff. training for 777X ! An suggestion for Boeing Company regarding the E/E access hatch, for the safety reasons maybe will be better to change the location to the cockpit(as the A33o has). Good luck with all the coming tests and with the test flight. the folding wings were also supposed to be part of the 777 program from the start…but no airline was interrested so it was cnacelled.